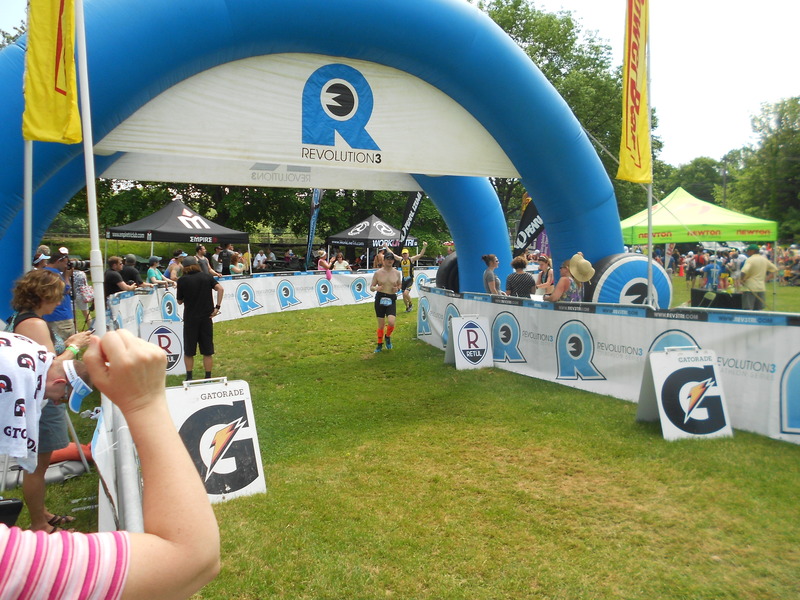 A few weeks ago was Rev3 Quassy in Middlebury, CT. I have been incredibly busy and/or focused on other things the past few weeks. I am still searching for a job, and becoming increasingly frustrated at the terribly limited market out there. The school year is finally over and graduation is now behind us…and I have a free night to be able to sit down and write. Before I start my report, I do have to say that Rev3 always puts on a great race and is a top notch race company. Their expos and packet pick ups are always very well organized and I love that they take your picture to put up on the big screen when you cross the finish line. Amy and I made the drive up to Connecticut Saturday morning during the running of the Olympic Race. We got to our hotel just after noon. We checked in, unpacked some stuff and set out to Quassy Amusement Park to pick up my packet and drop off my bike. This was my first trip to Quassy, and it really was very nice. 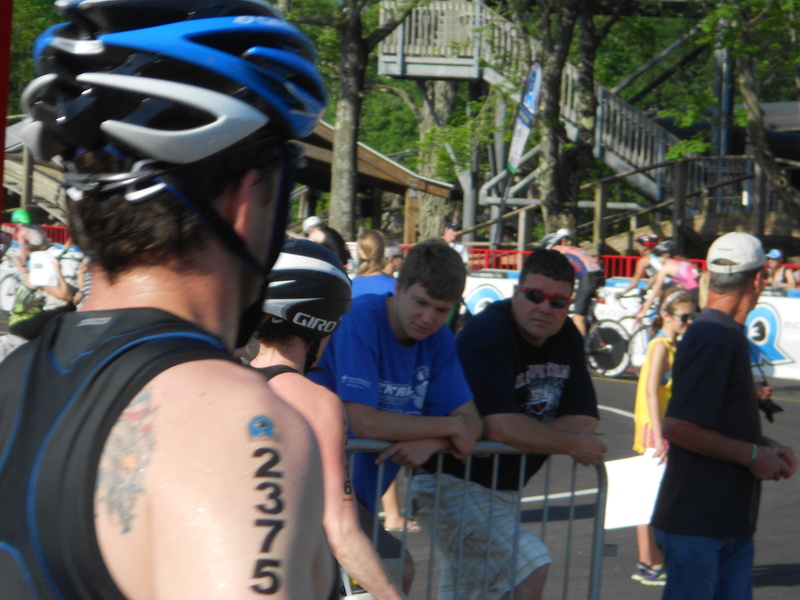 We walked over to the expo, grabbed my packet and timing chip, got some serious sun burn and waited to drop off my bike. It was a hot hot day for the beginning June and the sun was very very strong. Instead of driving right back to the hotel, I wanted to drive the bike course. Another thing I really like about Rev3 races is how well their courses are marked. I was able to drive the bike course without having a cue sheet just by following their markings. We drove the 56 miles, saw the hills I would be climbing, and headed back to the hotel. I thought having a sense of the course would make me feel better, but it really didn’t. My only memory of climbing during a triathlon was in my first TriRock NY and it was terrible. Seeing these hills which were worse than I remembered those to be was terrifying. That was a different time though and I just had to keep telling myself that so I felt better. Anyway, race morning finally arrived and we were up with the sun to head over to the park. I was one of the last waves to head out for my swim leg so I had almost an hour to wait from the time the first wave went off to the time I finally was toeing the line at the water’s edge. During that time, I just sat talking to Amy about god knows what just some completely random stuff. My god, is it my turn to swim yet! I got tired of waiting, so I went in a splashed around in the practice area. Finally after what seemed like forever, it was finally my wave being called into the start corral. 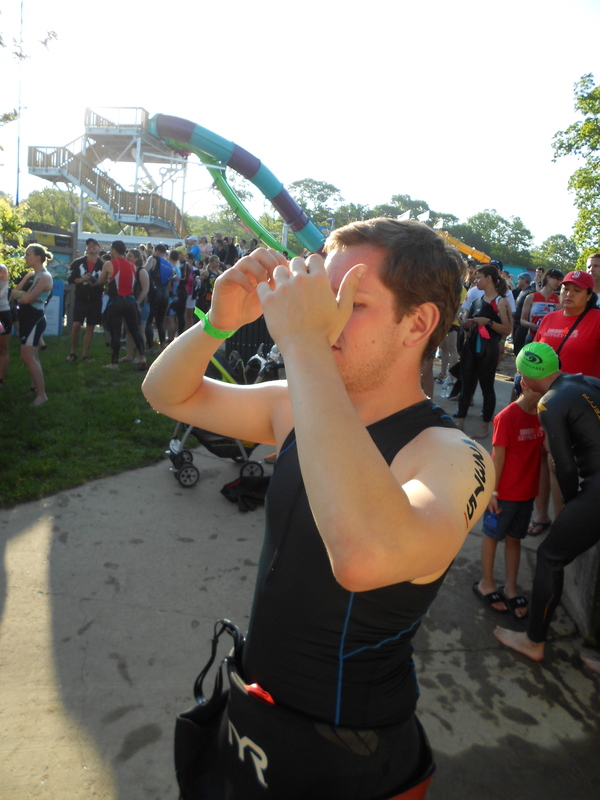 I put my goggles and swim cap on, made my way to the far left of the start line and toward the back of the crowd. I like to let everyone swim all over each other in a big crowd, get frustrated and annoyed, and then I come by and pass them after the crowd opens up a little bit. 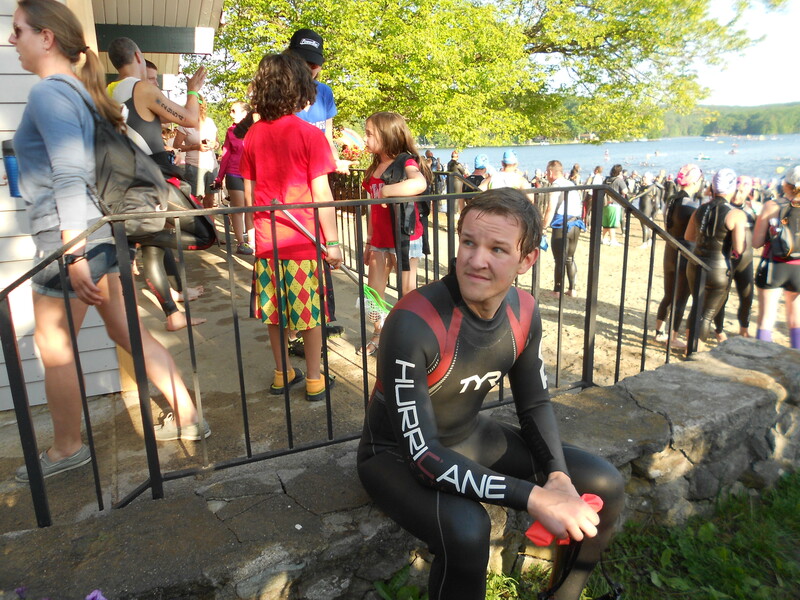 I had one of my better tri swims in this race. Was keeping a nice straight line without having to sight as often as i usually would. Plus, swimming in fresh water is a joy after having had my last few tris in salt water. 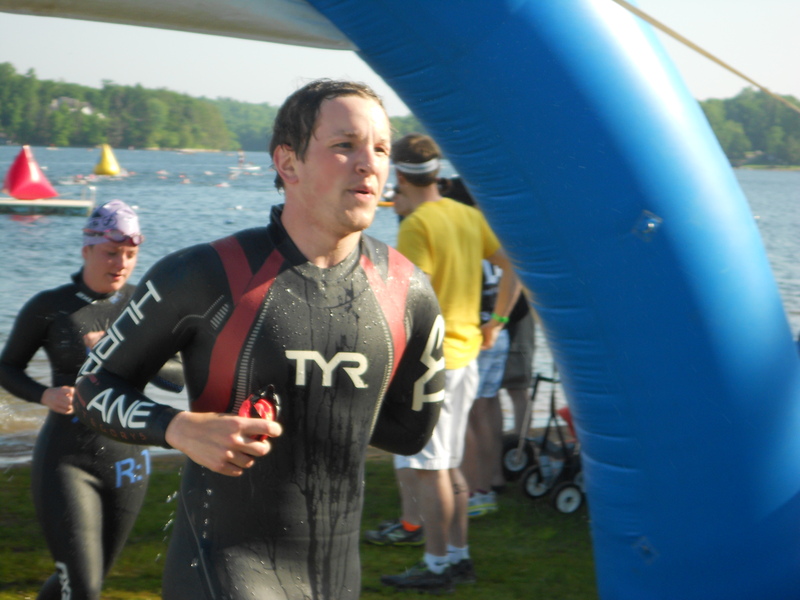 Coming out of the water, I made the jog up the grass to the transition area. I completely forgot what number I was and got a little lost in transition but what was nice about being one of the last waves to start was that most of the bikes had already been taken out of transition so I quickly spotted my Trek Speed Concept and began a relatively quick transition. I promised Amy I would put sunscreen on in both T1 and T2 and saw her leaning up on the fence so I had to take some time to spray some on before heading out for the bike leg of the race. I started the bike leg and as everyone has said, the first 3 – 5 miles are flat and give you a chance to get your legs under you before you spend the next 50+ miles either climbing or descending. I knew the toughest climbs came between miles 25 and 32 so I knew once I got past there It wouldn’t be smooth sailing, but I would be okay. I climbed the hills much better than I expected to. I only remembered hills being a nightmare, but at almost 100 pounds lighter than I was back then and more toned and muscular, I had no real trouble with the climbs. I rode back into transition and contemplated whether or not i was going to slip my feet out of my shoes or unclip the shoes to dismount my bike. 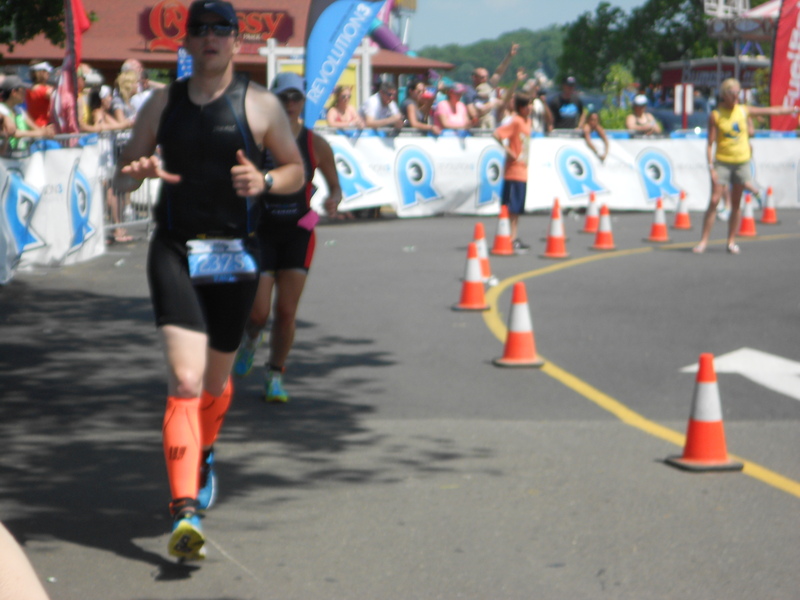 My last half, I decided too late to pull my feet out and ended having one foot in and one foot out when i got the the dismount line. I didn’t want that to happen again, so I made the decision early to slip my feet out of my shoes. I did that with no problem and ran into T2 to get my run stuff on to start the 13 mile run. The run was very hilly. I was expecting hills, but not as many I guess. I powered through the run though and told myself to run from aid station to aid station. There were a ton of great people out along the course cheering. Overall a great course. This race was another great one. 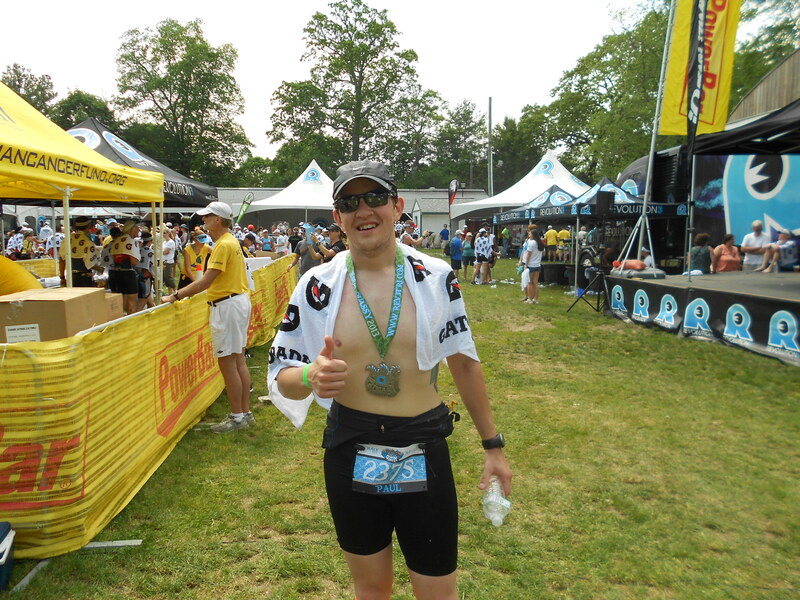 I really enjoy Rev 3 events as I was saying earlier in this post. They are always so well organized and athlete friendly. Finish: 6:25:03 A half PR by almost 3 minutes.